Maxine Clark is one of the true innovators in the retail industry. During her career, her ability to spot emerging retail and merchandising trends and her insight into the desires of the American consumer have generated growth for retail leaders, including department store, discount and specialty stores. 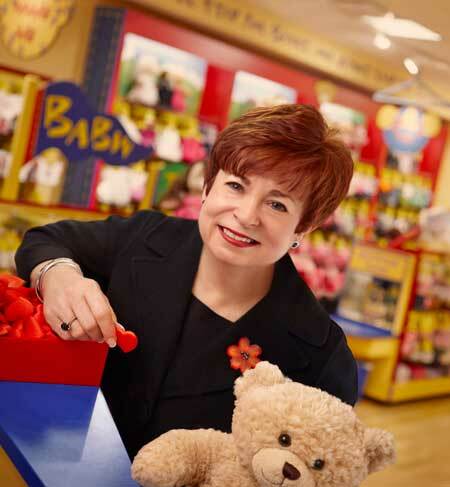 In 1997, she founded Build-A-Bear Workshop®, a teddy-bear themed retail-entertainment experience. Today there are more than 400 Build-A-Bear Workshop stores worldwide. In June 2013, Maxine stepped down from her Chief Executive Bear role to apply her entrepreneurial skills to her passion for improving K-12 public education and to invest in and mentor women and minority entrepreneurs. Maxine credits her teachers as her foundation for success—classroom teachers and mentors alike. To honor them she gives back. Her next “act” is to make public education much more consumer friendly by creating more access for families and students to systems and supports to enrich each child’s learning experience. Launched in 2015, is her ﬁrst product, Blueprint4SummerSTL, a free and easy-to-use mobile app designed to help ALL families navigate the best summer activities for their children. Her latest venture is the Delmar DivINe™—the transformation of a neighborhood eyesore into a multi-use real estate development to open in Spring, 2019. Maxine is also a Managing Partner of Prosper Women’s Capital, a St. Louis based fund created to invest in women owned businesses in the St. Louis area and a member of the Board of Advisors of Lewis & Clark Ventures, a St. Louis based private equity ﬁrm. In 2008, Maxine Clark was named one of The 25 Most Inﬂuential People in Retailing by Chain Store Age; in 2006, she was inducted into the Junior Achievement National Business Hall of Fame. Maxine was named one of the Wonder Women of Toys by Playthings magazine and Women in Toys, and was also one of the National Finalists in Retail for the Ernst & Young Entrepreneur of the Year 2004. In 2005, the National Association of Small Business Investment Companies made Build-A-Bear Workshop Portfolio Company of the Year; it was named one of the International Council of Shopping Centers “Hottest Retailers of 2004” and the Retail Innovator of the Year for 2001 by The National Retail Federation. In 2017 Build-A-Bear Workshop was named to the FORTUNE Best Companies to Work For® list for the ninth year in a row. In 2017 Maxine was named to the Missouri Public Affairs Hall of Fame and in 2015 was named Women of the Year by the Greater Missouri Leadership Foundation. In addition to her seat on the Build-A-Bear Workshop Board, Maxine is a member of the Board of Directors of Footlocker, Inc. and Gymboree. Maxine is a recent past member of the National Board of Trustees of Teach For America and is on the local St. Louis regional board, the Board of Trustees and the Executive Committee of Washington University in St. Louis, The Board of Directors and Executive Committee of Barnes Jewish Hospital and its Goldfarb School of Nursing, the Board of Directors of Beyond Housing and Parents As Teachers, the national Board of PBS and the local Nine Network of Public Media Board of Directors where she is the recent past Board Chair. She is also a member of the Committee of 200. Maxine is a graduate of the University of Georgia, and holds an Honorary Doctor of Laws degree from Saint Louis University and A Doctor of Humane Letters in Education from the University of Missouri St. Louis and an Honorary Associates degree from St. Louis Community College. In 2006, she published her ﬁrst book “The Bear Necessities of Business: Building a Company with Heart”.